Robin Hood: Feathers of Fortune Video Slot Review - Casino Answers! Robin Hood: Feathers of Fortune is a 5-reel, 243-way video slot developed by Microgaming, featuring stacked wild symbols, scatter wins, multipliers, a free spins feature and a bonus game. 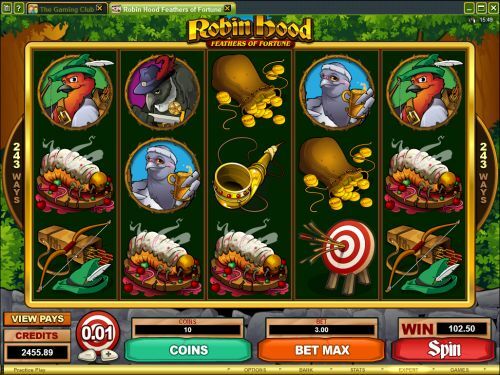 You can play the Robin Hood: Feathers of Fortune video slot at Bovada. Coin values on the Robin Hood slot machine are $0.01, $0.02 and $0.05. You can bet 1-10 coins per line. The minimum bet that you can make on the Robin Hood slot game is a penny per spin up to the maximum total bet of $15 per spin. Robin Hood: Feathers of Fortune has a low betting range that is best suited for casual players. To play the Robin Hood online slot game, select your bet and press the “Spin” button. To play all 10 coins on a spin, press the “Bet Max” button to spin the reels. The Robin Hood Logo is the top paying symbol on the Robin Hood video slot. If you land 5 adjacent symbols, you will win the 500 coin top jackpot. The Robin Hood Logo symbol is a stacked wild symbol and will substitute for all symbols except for the Scattered Wanted Poster and Robin Hood bonus symbols. Although rare, the Robin Hood bonus symbol itself is a high paying symbol, as it can pay up to 400X your bet per line. You can win up to 1,215,000 coins when you play the Robin Hood: Feathers of Fortune video slot at Bovada! The Wanted Poster is a scatter symbol on Robin Hood: Feathers of Fortune. 3, 4 or 5 Scattered Wanted Posters will pay out 5X, 10X or 100X your total bet plus award you with 15 free spins at a 2X multiplier. All wins are doubled during the free spins feature. All bets played during the free spins feature as the same as the game that triggered the feature. The free spins feature can be re-triggered. The bonus game can be re-triggered during the free spins feature. If the bonus game is triggered at the same time as the free spins feature, the bonus game will be played first. 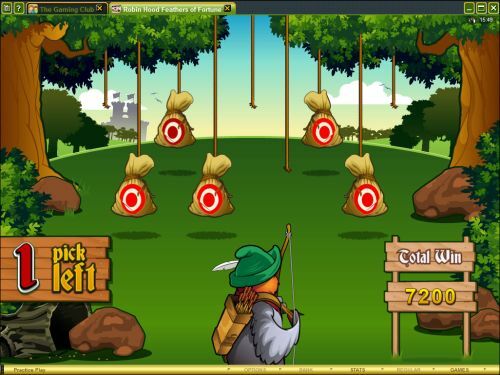 If the Robin Hood bonus symbol lands on reels 1 and 5 at the same time, you will trigger the Archery bonus game. You will have the opportunity to shoot 5 bags, which will pay anywhere from 2X your total bet up to 15X your total bet. Bonus wins will not be multiplied by the free spins multipliers. As you can see by the screenshot provided below, the bonus game looks excellent and can lead to some major winnings, which you can then distribute to the poor. Way wins awarded for left to right adjacent symbol combinations. All wins pay left to right, except for scatter wins (which pay any). Way wins are paid according to the Paytable. Way wins are multiplied by the coins bet. To use the autoplay mode on the Robin Hood online slot machine, you must hit the “Expert” button. You can now play 5 or 10 autoplay spins. For advanced settings, hit the “AutoPlay” button and you can now play 5, 10, 25, 50, 100, 250 or 500 autoplay spins and stop autoplay if a win exceeds or equals $100, $500, $1000, $5000 or $9999. Autoplay will stop on any feature contained in the game. You can stop autoplay at any time. Robin Hood is a new offering from Microgaming, and a truly fantastic one at that. They are definitely on a role when it comes to releasing quality video slots – many of which being 243-way video slots. If you are interested in playing 243-way video slots, Microgaming is definitely the way to go with slots like this Robin Hood video slot and many more. To play the Robin Hood: Feathers of Fortune online slot, sign up and make a deposit today at Bovada! Are players from the United States able to play the Robin Hood slot machine for real money? No, American players are unable to play the Robin Hood online slot game for real money at this time. However, you can play another Robin Hood slot called Prince of Sherwood over at Bovada. Is there a flash game of the Robin Hood video slot that I can play for free? Although a flash game of Robin Hood: Feathers of Fortune is not currently being offered at Bovada, keep checking back and hopefully one will be added soon! If you are interested in more 243-way video slots (many of which are also found at Microgaming online casinos), please see our complete list of all ways video slots.